My Shaker counter, featured in the June 2012 issue of Popular Woodworking Magazine, has small diamond inlay pieces set as escutcheons. As I finished the project, I paid particular attention to those inlays – I wanted them to stay white. It was about that same time that the folks at The Finishing Store asked me to write an article for their newsletter. Naturally, how to protect inlay came to mind. Below is the article I contributed to The Finishing Store newsletter. You can read the piece here, but you should also check out their web site and monthly newsletters for more information. This month Bob Flexner has a piece about boiled linseed oil – a highly debated topic in reproducing period furniture (click here). One of my earliest furniture projects was a Sheraton Field bed that I built when I was 14 years old. Later, another version of that same bed was built. This time, however, I inlaid small Birdseye panels into the square sections of the mahogany posts – an idea that caught my eye while surfing museum books. From nearly the beginning of my furniture building career, my favorite finish has used aniline dye to color my project with top coats of shellac and/or lacquer. As I contemplated how to finish the bed, I was concerned that all the work put into those Birdseye panels would be for naught if my inlay became muted as dye was added. 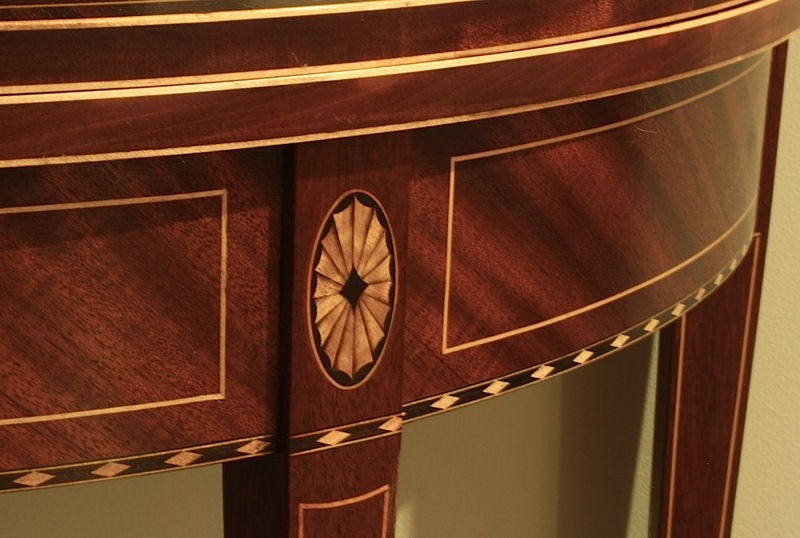 I believed that the distinctive figure and light color of the Birdseye inlay against the reddish hue of the mahogany would be enough of a contrast to keep the inlay a real eye catcher in the finished bed. I moved forward. As I sprayed dye onto my first post, the panels changed in color far greater than I expected. While the mahogany achieved a deep red hue, my Birdseye, beginning as a pale yellowish color, gained almost that same red hue. In the end, the panels were barely visible. I learned a valuable lesson that day, one that I adhere to strictly these days. Protect your inlay. How can you achieve great color on a project without muting or otherwise coloring the inlay in the design? That’s a question I get get asked many times. There are a few techniques I’ll share to help keep your inlay fresh, but only one that works every time. If you have an inlay-laden project sitting in your finish room waiting to be completed, or you have little patience as I explore options that work but not necessarily all the time, you may want to jump ahead. Be warned however, there is beneficial information in the less effective techniques discussed. As I contemplated my first heavily inlaid project after my ill-fated bed finish, I, like all good woodworkers did, turned to books and magazines for ideas and to discover the correct method to color everything but my inlay. (Today, we would turn to the Internet for the same information.) I did get get a couple nice pointers, but are these the way to work? One technique that I read about, but have not attempted on an actual project, is to install inlay after your finish is complete. For the life of me, I cannot see any benefit to this process. I suppose, if you were more than cautious, you could bring your inlay to just even with a completed finish, but if you go one millimeter more, you’re in trouble. I would lay odds that I would scrape, sand or otherwise hit the completed finish as I tried to level inlay. That would have me starting over. For me, this one paragraph sums up all that needs to be said about this technique. No thank you. Chemical coloration is another option. Chemicals can color some woods without coloring others, but for the most part we do not work with chemicals today as woodworkers did centuries or even decades ago. In fact, if you’re building a reproduction, there is little written evidence that the chemicals discussed below were used on period pieces built before 1800. Most period colorants were made using natural products. Also, many of the chemicals mentioned are not easily accessible or simply too caustic to use. Even if you decide to don a hazmat suit and make chemicals your choice to color hardwoods, the process is more involved than aniline dyes or stains. Not only do you apply your chemicals, but there can be the added steps of neutralization. What neutralizes what is something you need to know prior to getting started. In the end, I’m not a chemist, nor do I wish to be one. And my finish room is not equipped for chemical mishaps. Besides, how many different soakings do you think your project can withstand before you run into problems? The preponderance of information gathered from Internet woodworkers suggests that you coat inlay with a topcoat of some kind prior to a dye application. To me, this practice is conceivable if you’re coating a nice patera or larger-sized inlay, but what patience does it take to coat a piece of 1/32″ stringing that runs up and down card table legs? What brush should you use and how steady must your hand be? Don’t think about taping off each and every piece of string. If the time factor doesn’t bog you down, dealing with seepage under your tape will frustrate you to no end. And remember, you need to cover your string and only the string – topcoat that spills over the edge or is wicked into nearby woods also repels dye and that’s not going to look good in a completed finish. One additional thought. You must choose your top coat to work with your dye or stain, not against it. As an example, if your dye was alcohol based, you would not want to use shellac to guard your inlay because shellac is also cut with alcohol. I tried the coat-your-inlay technique on a slant-lid desk prospect door that had the only piece of inlay used on the project. I taped off an inlaid maple diamond and sprayed a couple layers of lacquer over only my inlay. I let it dry completely before moving on to dye the desk with water-based aniline dye. As I soaked my desk with dye, I noticed that my diamond had gone from near colorless (a high grade in diamonds) to a light yellow. It appeared as though my top coat held off a complete coloring of the inlay, but that there was some color added. Why? In a previous article, I wrote about glaze. One area discussed was why you should glaze your entire project instead of simply around mouldings or other areas expected to show age. The same reason also comes into play when dying over inlay which has a topcoat added. Your topcoat, while smooth to the touch, has small craters if viewed under magnification, even after sanding. Those craters gather dye and that turns inlay from white to something less than white. It may be acceptable, but it is not uncolored. On a recently completed project I again used this method, but added another couple steps to kick up my results. As I installed my inlay, I made sure to spread glue around the edges of my recess. This would help deter dye from wicking into the inlay. After spraying a couple light coats of lacquer over the inlay, I also taped over the inlay to eliminate any microscopic craters from drinking in my dye. The added steps did the trick. In fact, I felt that the inlay may have ended up too bright when compared to my dyed finish, but that was taken care of as I added several additional coats of finish. I would highly recommend this technique if you have minimal inlay in your project, but if you are working with myriad amounts of string and other inlay the process is long and tiresome and boring and dull. Now that we have covered techniques that should be avoided and those that work some of the time, let’s take a look at the one technique that I find works every time I use it. 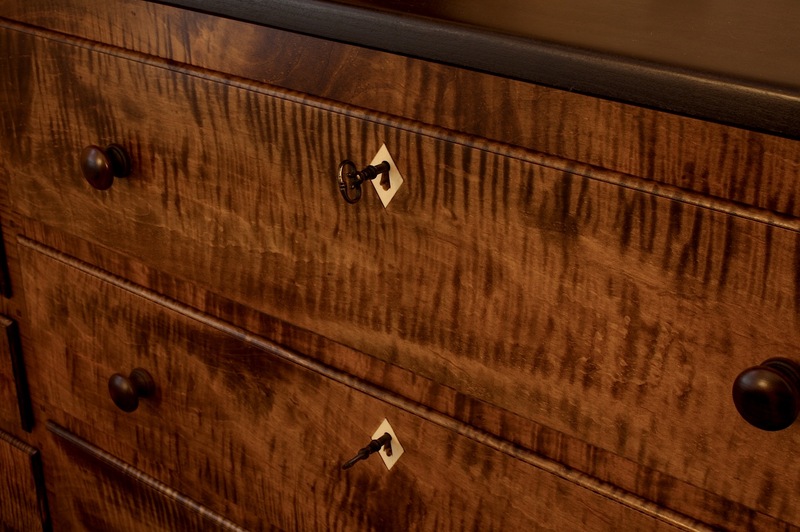 If you study pieces found at our museums, you’ll find mahogany, walnut and cherry furniture full of inlay. There are spice boxes with extravagant compass inlay doors, card tables built during the Federal period that have intricate leg, apron and top stringing, and English tea caddies with a multitude of banding work. In most examples you’ll find that the woods used did not have its color altered in any way. The technique that works all the time is to build using woods and inlays that do not require color alteration. No dyes, stains or chemicals. I know it’s simple, but it is the best technique. If you keep the rules simple, success is much easier to find. One additional note worth mentioning to achieve the best look in your project is to carefully select woods for any project you intend to finish without colorants. In fact, this is a good idea when doing any woodworking. Make sure your wood matches in color. That means before you begin have enough lumber on hand to get through your project. My first thought was to use Shellac or Lacquer over the inlay depending on what was going to be used on the other part of it… I was pretty close! Not too long ago, I had a project were text was carved into the piece to record the special gift; “To, From, & Event”… I wanted to fill the carved text with Black Epoxy and I didn’t want it to bleed into the main part of the piece… I thought about it for a long time… I finally decided to carefully brush Shellac around the text as well as on little places like the inside of “O”‘s, “R”‘s, etc. Then, I taped off all around the text to be filled as well as other larger areas within the text. After waiting an extra amount of time to be sure it was all cured, I went at it with a 80 grit belt sander to get the large amounts of Epoxy off following it up with other finer-grit sanders. It worked out just Great! No bleeding at all! I was really proud of the outcome! Thank you for your very educational tutorials, ideas, techniques, etc.